The shallow rocky ambients near the coast contain a large amount of cracks that serve as a refuge for many organisms. This area is characterised by its highly oxygenated waters and generally warmer than those of the lower layers. We find photophyl vegetation (which needs a lot of light) and green and brown algae. Generally, it is an area with great biological heterogeneity. The animals in these ambients develop defence mechanisms such as needles associated with poisonous glands, or the adoption of cryptic colours (similar to those of the surroundings). There are also many animals that seek refuge in the cracks and holes in the rocks, such as the moray (Muraena helena). Among the marine invertebrates that live on the rocks or hidden among them are the sea anemone (Anemonia sulcata), of the well-known jellyfish group. The two have the same defence system: the cnidocysts, cells loaded with stinging liquid that are triggered when touched and penetrate the skin. 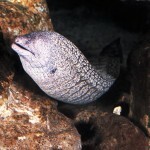 Fauna: Mediterranean moray (Muraena helena), red sea anemone (Actinia equina), brown date mussel (Lithophaga lithophaga), Clathrina clathrus, sea urchin (Arbacia lixula), purple sea urchin (Paracentrotus lividus), violet sea-urchin (Sphaerechinus granularis), white seabream (Diplodus sargus), zebra sea bream (Diplodus cervinus), annular seabream (Diplodus annularis), common two-banded seabream (Diplodus vulgaris), spotted seabass (Dicentrarchus punctatus), peacock wrasse (Symphodus tinca), saupe (Sarpa salpa), kleiner dreiflossen-schleimfisch (Tripterygion melanurus), Tompot blenny (Blennius gattorugine). Sandy areas, apparently desolated, hide a large number of marine species. The sandy coastal communities house a poorer fauna and flora that rocky coasts, or at least which are more difficult to observe: Everything is hidden. Sandy areas are the home to a large number of organisms that have adapted their lives to remaining buried in the sand. 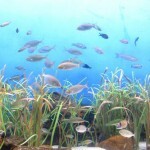 Among the fish, we see that the sandy areas are the kingdom of flat fish, rays and spiders. 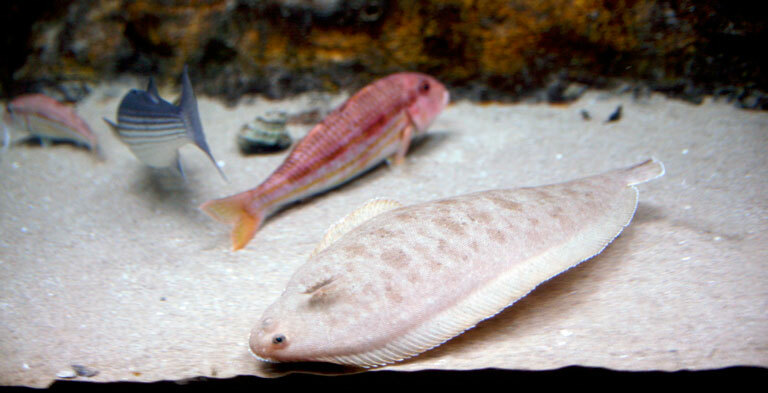 Fish with a toasted colour and pigmented with small white and dark spots (cryptic colouring) that camouflage so well in the sand that they are very difficult to distinguish. Often the only sign of their presence is a light silhouette in the sand, or two small eyes moving nervously, one on either side. Among the invertebrates are the clams that live more numerously alongside sea snails, cuttlefish, sea stars, sea cucumbers and different crustaceans that hide in the sand. 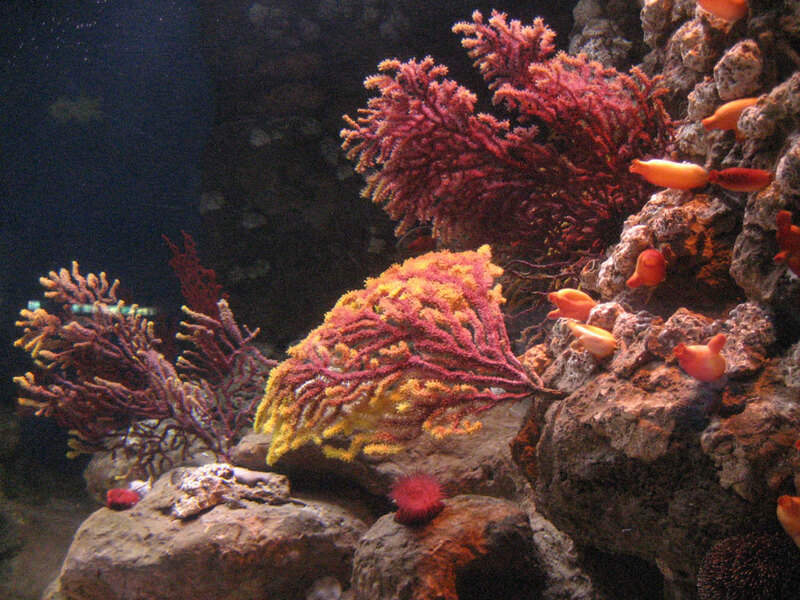 Furthermore, alongside these the marine fanerogamas are beginning to appear (superior plats) that facilitate the settlement of a whole range of associated fauna, both fish and marine invertebrates, which would find it difficult to live without the ideal hiding place and the resources offered by its existence. 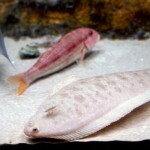 Fauna: Striped red mullet (Mullus surmuletus), Cerianthus membranaceus, warty venus (Venus verrucosa), cottonspinner (Holothuria tubulosa), Astropecten spinulosus, Callionymus festivus, turbot (Psetta maxima), wide-eyed flounder (Bothus podas), common sole (Solea vulgaris), pearly razorfish (Xyrichthis novacula), eagle ray (Myliobatis aquila). Freshwater and salt water come together in the coastal lagoons of the delta, creating an environment of highly singular characteristics. The Ebro delta, in the extreme south east of Catalonia, has an extension of approximately 350 km². This space is a protected nature park as it is a singular habitat not only for marine organisms, but also for the numerous migratory sea birds that generally settle there temporarily. It is an intermediate step between freshwater (from the river Ebro) and sea water, so that the first, on going out into the sea, gradually mixes with the second, thus reducing the salinity. This creates a series of intermediate, fluctuating saline environments that does not facilitate the life of the different organisms that live there. The different species that live there can withstand relatively high falls and rises in the salinity, thanks to an effective regulation of the internal fluids. However, there are species that not only remain in the transition area (or water mixture), but insert completely in one water or the other. 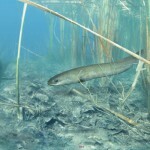 These are species that carry out the so-called migrations, such as the eel for instance (Anguilla anguilla). Flora: Enteromorpha prolifera, Dictyota dichotoma, Caulerpa prolifera. Fauna: Virgularia mirabilis, mantis shrimp (Squilla mantis), tuberculate cockle (Rudicardium tuberculatum), sea potato (Echinocardium cordatum), common sturgeon (Acipenser sturio), weeverfish (Trachinus vipera), striped mullet (Mugil cephalus), striped seabream (Pagellus mormyrus), meagre (Argyrosomus regius), gilthead bream (Sparus aurata), eel (Anguilla anguilla). The progressive growth of incrustating algae causes the formation of small cracks between the rocks, thus creating a habitat that is suitable for numerous fish and invertebrates. Generally, water erosion forms a series of tunnels and galleries, which are known as underwater caves, which give very peculiar scenery generally poor in organisms. In these places, the little light there is prevents the growth of vegetable life and as we move inside, the fauna on the walls becomes poorer and poorer until it practically disappears. The same thing happens with other parameters: the oxygen, temperature and nutrients are scarcer on the inside. 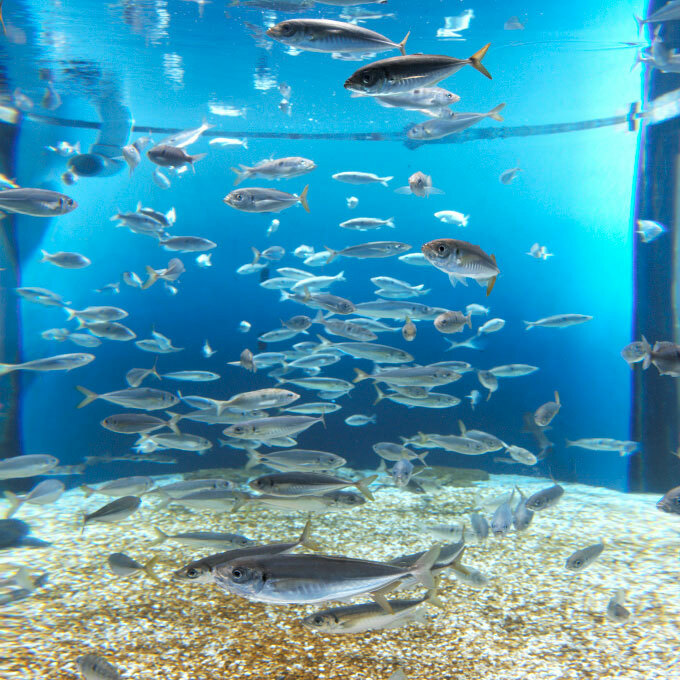 In tunnels, on the other hand, thanks to the currents that facilitate water circulation, the walls have a richer fauna, above all filtering invertebrate animals. A similar thing happens with cracks and overhangs. Here, despite not being completely enclosed, the light that reaches them is poor, and as with caves and tunnels they become the favourite habitat or hiding place for a certain number of organisms. 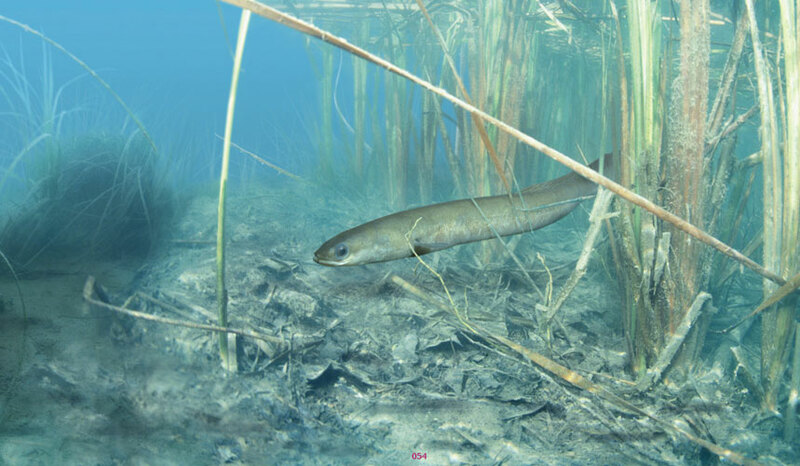 In this way, we can find species that use these places as a refuge, as is the case of the conger eel; others, on the other hand, use them as a favourite habitat to carry out their lives: lobsters. We can also find seasonal fish such as striped red mullet and certain gobies. Fauna: Crambe crambe, Clathrina clathrus, red tubeworm (Serpula vermicularis), slipper lobster (Scyllarus arctus), spiny starfish (Marthasterias glacialis), false coral (Myriapora truncata), sea potato (Halocynthia papillosa), dusky grouper (Epinephelus marginatus), brown meagre (Sciaena umbra), peacock wrasse(Symphodus tinca). This plant, Neptune grass (Posidonia oceanica), endemic to the Mediterranean, with tape-like leaves, forms extensive undulating fields that shelter and feed numerous species. 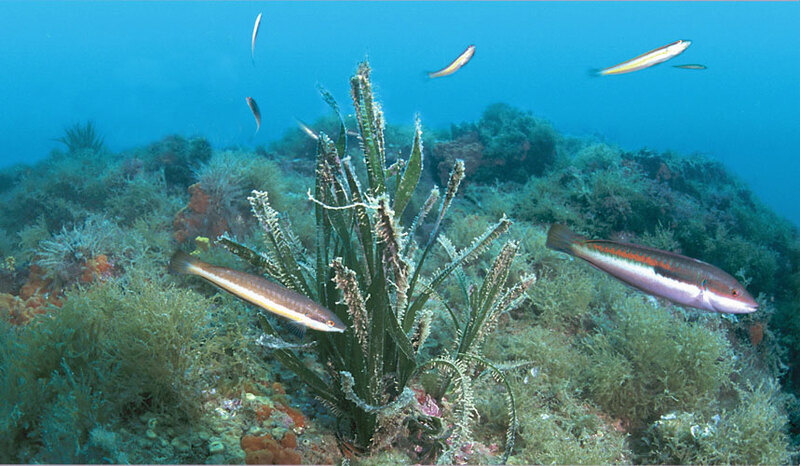 The Neptune grass fields (Posidonia oceanica) are one of the most characteristics communities of the Mediterranean coastline. They spread on gentle beds, preferably of sand in unexposed coastal segments and at depths of between almost the surface and 35 m. This superior plant (it is not an algae) forms beams of 5-7 tape-like leaves of up to almost a metre in length. It grows with such density and extension that it covers the floor, thus forming fields like any land seed used in monocultivation. It is important because it produces a large amount of organic matter (food) and oxygen, (1 m2 leaves provide some 10 l. of oxygen a day). It therefore considerably enriches other ecosystems. It also forms reefs in many bays and beaches that prevent erosion and their disappearance. This plant serves as a support for other organisms, both algae and animals, especially bryozoans and hydraria that install on its leaves, thus forming the so-called “epiphyte felt”. It also houses a series of fish and invertebrates that feed from its leaves or find sufficient protection to mate and reproduce. Likewise, its sediment enables the development of bivalve molluscs and an infinite number of worms. It is currently in severe regression due to the continuous polluted waste disposal, port constructions, illegal drag fishing, aquiculture, vessel anchoring and the invasion of exotic species. Fauna: Cliona viridis, Sertularia perpusilla, peacock worm (Sabella pavonina), sea-ears (Haliotis lamellosa), sea hare (Aplysia fasciata), common cuttlefish (Sepia officinalis), cushion star (Asterina gibbosa), purple sea urchin (Paracentrotus lividus), damsel fish (Chromis chromis), short-snouted seahorse (Hippocampus hippocampus), broad-nosed pipefish (Syngnathus typhle), greater pipefish (Syngnathus acus), red star-fish (Echinaster sepositus), saupe(Sarpa salpa). 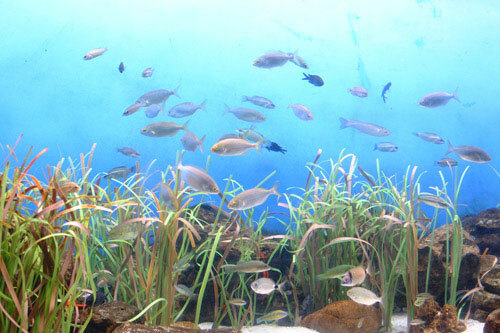 In shallow, calms waters, superior plants and algae form extensive meadows rich in marine life. This area is characterised as being calmer and having less light than the surface waters. The progressive attenuation of the light causes a change in the vegetation and general scenery. The vegetable species of algae and marine plants adapted to conditions of little light, esciaphyls,replace those fully adapted to light, the photophyls. We can find green algae colonising the area thanks to the ryzoids or small roots that keep them fixed to the substrate. The accumulation of their leaves than fall and decompose turn the bed muddy. The fish fauna associated with this vegetable community is around 50 species, including the gobies, striped red mullet, slugs, etc. 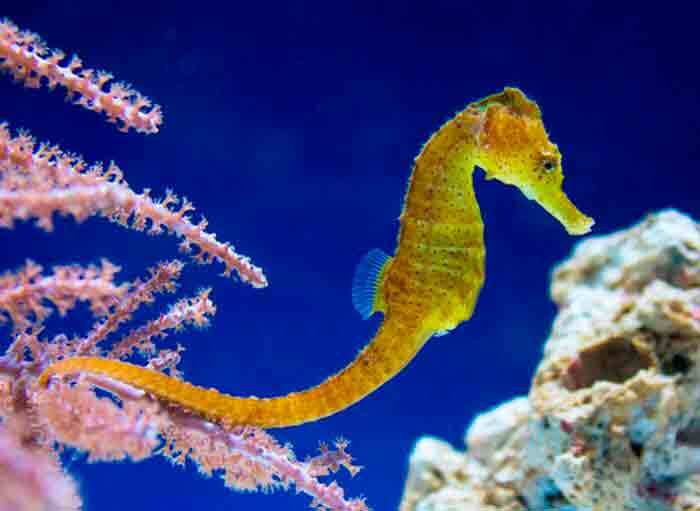 Occaionally these places are visited by young forms of littoral species in search of refuge. Flora: Caulerpa prolifera, lesser Neptune grass (Cymodocea nodosa), Zostera nana. Fauna: Verongia aerophoba, sea anemone (Actinia cari), Elysia timida, sabellid worm (Spirographis spallanzani), shore clingfish (Lepadogaster lepadogaster), striped red mullet (Mullus surmuletus), Tripterygion melanurus, red-mouthed goby (Gobius cruentatus), damsel fish (Chromis chromis), ornate wrasse (Thalassoma pavo), rainbow wrasse (Coris julis). When the light falls short, the green plants are progressively replaced by colonies of incrustating animals that form a singular habitat. 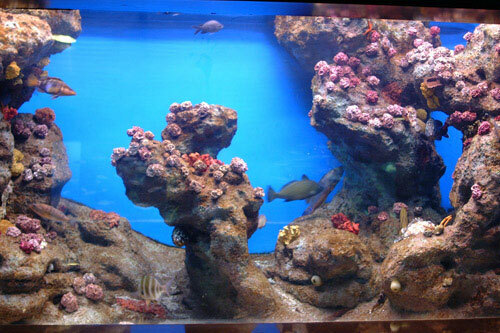 The floors that give way to the coralline community are called precoralline. This precoralline community is considered an area of transition and is characterised by its biological richness. When it penetrates through the water, the light is progressively absorbed and rapidly attenuates in the depths. This means that different algae have to occupy the space selectively, establishing different areas of preference according to the intensity and quality of he light that reaches them. The organisms living in these areas have reddish colourings that allow them to camouflage themselves in surroundings where red light does not reach. Flora: Purse codium (Codium bursa), Codium vermilara, Cladophora pellucida. 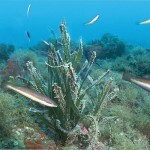 Fauna: Axinella damicornis, boring sponge (Cliona celata), Eunicella singularis, Bonellia viridis, variegated scallop (Chlamys varia), spiny fileclam (Lima lima), european spiny lobster (Palinurus elephas), Antedon mediterranea, european conger (Conger conger), butterfly-blenny (Blennius ocellaris), small red scorpion fish (Scorpaena notata), painted comber (Serranus scriba), comber (Serranus cabrilla), black scorpionfish (Scorpaena porcus). In the rocky areas with little light in the Mediterranean there is an interesting community of chalky algae growing in adjacent horizontal plains to take advantage of the little light available. 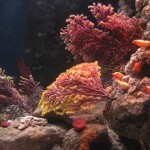 There are also large, colourful gorgonia. In the Mediterranean, the so-called coralline area is characterised as colonised by a large number of chalky algae, among which other suspensive invertebrate organisms live: sponges, ascidia, briozou and sea fans, in a large variety of colours: yellows, pinks and oranges. The fall in the amount of light is one of the key factors for the development of these algae, which are enhanced while other disappear that need more light and which would undoubtedly annul them. Furthermore, the calcification gives them the necessary strength not to be eaten by certain herbivores. Although they grow very slowly, they fight to obtain as much light as possible, which causes a singular growth in horizontal plains, with even some layers covering and superimposing over others. 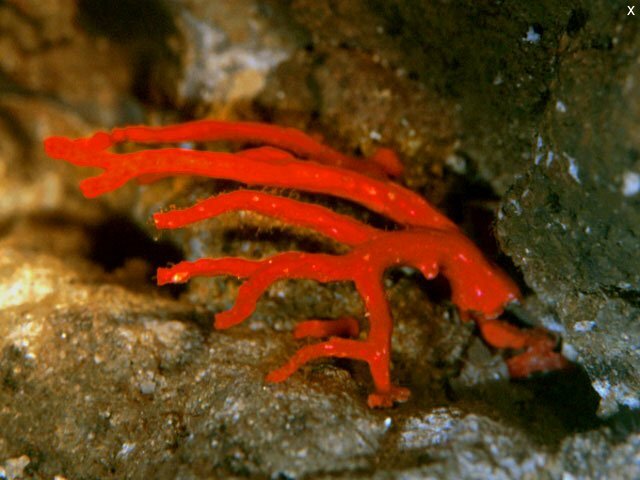 Fauna: Ircinia oros, Petrosia ficiformis, red gorgonia (Paramuricea clavata), red precious coral (Corallium rubrum), european lobster (Homarus gamarus), Mediterranean locust lobster (Scyllarides latus), common brittle star (Ophiothrix fragilis), Astrospartus mediterraneus, Holoturia forskali, European conger (Conger conger), swallowtail sea perch (Anthias anthias), cardinal fish (Apogon imberbis), Leptogorgia sarmentosa, St. Peter’s fish (Zeus faber). Defying the hard conditions of the inter-tide area, characterised by the constant movement of the waves, there is a surprisingly large number of organisms. The inter-tide area is characterised as the area under the influence of the tides, although in the Mediterranean they are not very large (20 cm at most). At certain times and for reasons of the movement of the sea (generally waves), these areas are momentarily left without water. The invertebrates that live here have adapted to this situation and are capable of keeping water in their bodies to survive until the sea returns. 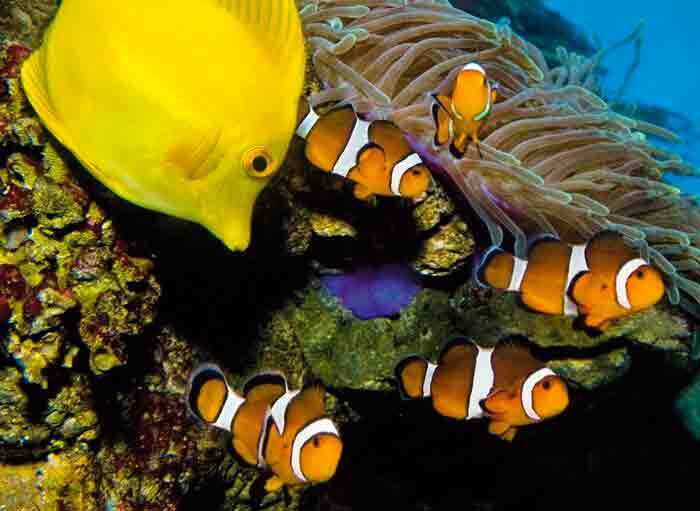 Furthermore, the fish are obliged to move periodically with the wave movement and the areas affected have a wealth of species where the stability of the water allows them. Fauna: Sycon raphanus, Sertularella ellisi, Mediterranean mussel (Mytilus galloprovincialis), acorn barnacle (Balanus perferatus), warty crab (Eriphia verrucosa), red sea anemone (Actinia equina), two-banded bream (Diplodus vulgaris), saddled bream (Oblada melanura). 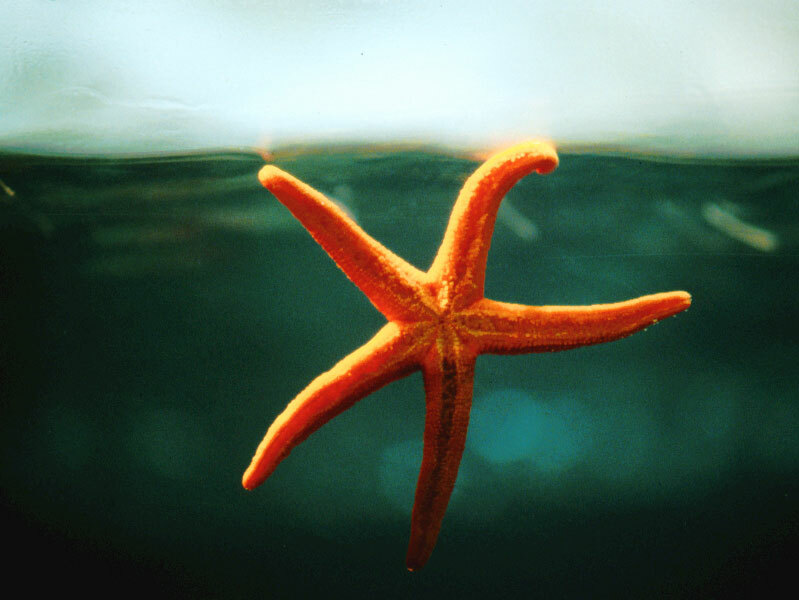 Many organisms have little contact with the sea bed; they spend their lives floating or swimming in the immesity of the sea. We talk about the pelagic community to refer to the marine bodies that swim or float in open waters or on the continental shelf. 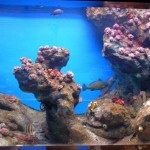 This is a community that does not depend on the sea bed, but which might visit it occasionally. Generally, the fish in this community are silver in colour, spindle-like in shape and have powerful muscles to allow them to swim quickly. They also frequently have dark colouring above and light below, to blend in with the bed or the clarity of the light. Some species live in large schools to protect themselves form their enemies and to hunt more effectively. These are gregarious species. On the other hand, other species live alone, occasionally relating to individuals of the same species and attacking alone. By contrast, the benthonic community is formed by organisms that closely depend on the bed, from which they often obatin refuge and food. 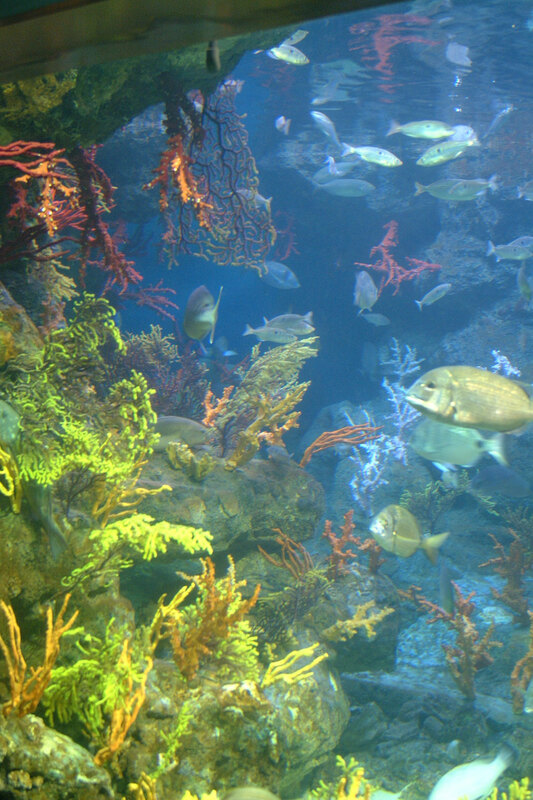 The fishes of this community normally try to blend in with the bed and are therefore brown with dark stains. 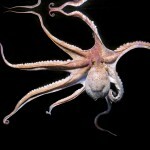 They usually have a more rounded tail in order not to create turbulence when they swim and to avoid being discovered. Fauna: Flying fish (Exocoetus volitans), black wing flyingfish (Hirundichthys rondelettii), Atlantic tuna (Thunnus sp. ), Luvar (Luvaris imperialis), atlantic mackerel (Scomber sp. ), basking shark (Cetorhinus maximus), European pilchard (Sardina pilchardus), European anchovy (Engraulis encrasicholus), Lesser spotted dogfish (Scyliorhinus canícula), Atlantic horse marckerel (Trachurus trachurus), pompano (Trachinotus ovatus). This community is found in the cracks and entrances to caves and tunnels, where the light is sufficiently dampened for the algae component to be very small or nil. It is formed by large colonies of briozous, sponges, ascidia, hydraria and poliquets, and its development also depends on the food available. 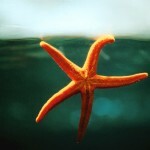 It is one of the most attractive sceneries of the sea beds. Fauna: Red precious coral (Corallium rubrum), Spirastrella cunctatrix, Leptosammia cuvieri, Dendrophyllia ramea, yellow cluster anemone (Parazoanthus axinellae), Dendrodoris grandiflora, Protula tubularia, swallowtail sea perch (Anthias anthias), cuckoo-wrasse (Labrus bimaculatus), butterfly-blenny (Blennius ocellaris), cardinal fish (Apogon imberbes), longspine spinefish (Macroramphosus scolopax). The islas Medas are one of the most important reserves of marine flora and fauna in the western Mediterranean. This small archipelago is formed by seven small chalky islands and some reefs, with a total surface area of 21.5 hectares. 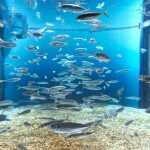 It is located one mile offshore in front of Estartit beach. The Islas Medas have been a protected area since 1990, and are the most important marine park in Catalonia. 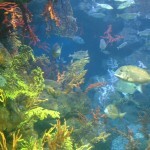 This marine reserve is an exceptional place for fish, for as human exploitation disappears, the number, variety and size of the species rapidly increase. 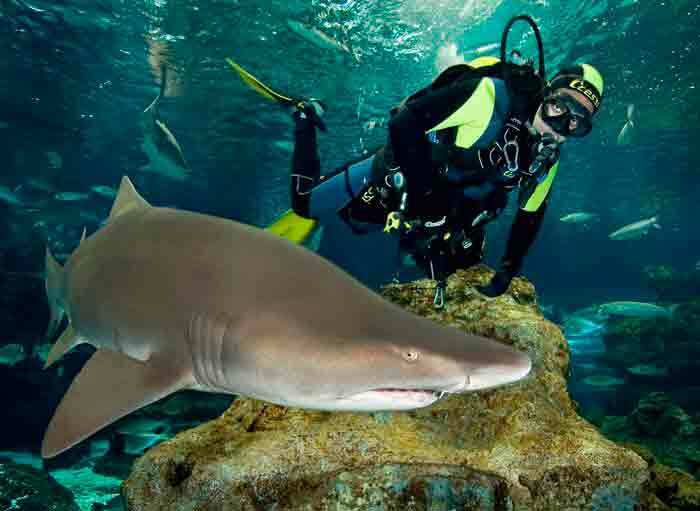 However, a protected area suffers the problems derived from excessive diving. Flora: Neptune Grass (Posidonia oceanica), Cystoseira mediterranea. 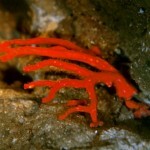 Fauna: Invertebrates: Hymeniacidon sanguinea, yellow sponge (Verongia aerophoba), Mediterranean mussel (Mytilus galloprovincialis). Fish: wreckfish (Polyprion americanus), European conger (Conger conger), Trigger fish (Balistes carolinensis), scorpion fish (Scorpaena scrofa), dusky grouper (Epinephelus marginatus). Birds: caspian gull (Larus cachinnans), cormorant (Phalacrocorax carbo), shag (Ph.aristotelis), little egret (Egretta garzetta), night heron (Nycticorax nycticorax), grey heron (Ardea cinerea). Benthos, a Greek word that means “bottom”, refers to the community of organisms that live at the bottom of the marine floor – whether fixed to it, partially buried in it or moving around but never going very far from it. 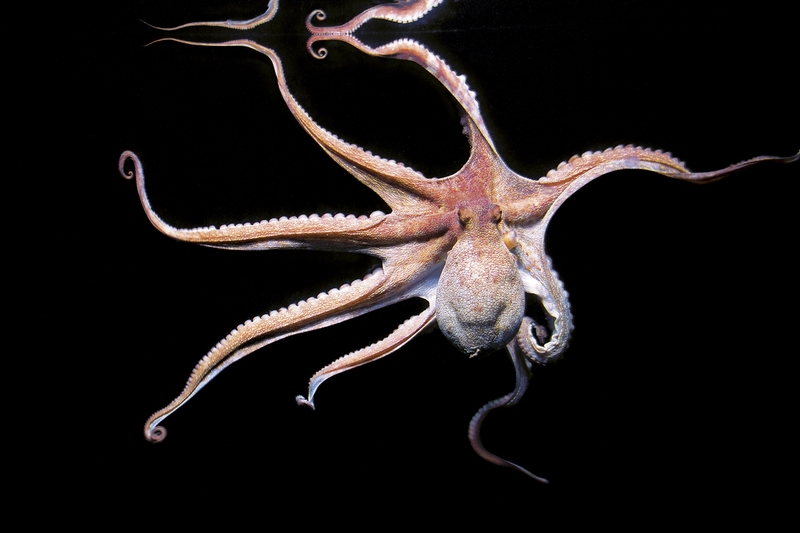 From rocky to sandy beds and from well-lit waters to absolute obscurity, benthos is present in a wide diversity of environments, playing host to organisms that have adapted in surprising ways.